The Genting Casino Coventry Blaze are delighted to announce the signing of 26-year-old American centre Shawn Pauly for the 2018/19 Elite League season. 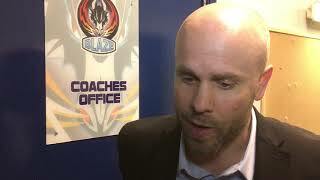 The Bellingham, Washington native had agreed a move to French club Lyon for the new season, however with news of the deal falling through, Blaze Head Coach Danny Stewart quickly swooped to bring the 6’0” left shooter to Coventry. Pauly comes to the club following two professional years in the ECHL with Missouri/Kansas City Mavericks (re-named in 2017). In 68 regular season games last season, he scored an impressive 24 goals with 17 assists for 41 points. In total for the Mavs, he iced 122 times with 55 points. Prior to his time in the coast, Pauly spent four years in the NCAA with the University of Connecticut where in his graduate season he was named Associate Captain. In the NCAA, he was consistently amongst the Huskies top point-contributers making 140 appearances with 83 points. As a junior, he registered 123 points over 155 games with the Wenatchee Wild, being named to the NAHL All-Rooke First Team in 2009/10. 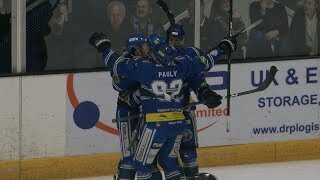 Shawn Pauly commented, “I can’t wait to bring my game over to the Coventry Blaze and I am excited to play in front of the supporters who have a reputation for being the best in the Elite League. “I play a hard, tough, but skilled style of game where I am reliable to win battles as well as produce offense.